Put the diced squash into a pot and cook with a few of the whole sage leaves, salt and 1 cup of the chicken stock. Cover and cook until tender, but not mushy, about 5-10 minutes. Meanwhile, chop 6 sage leaves fine and dice the onion. Heat the rest of the chicken stock and hold at a simmer. In another large pot or Dutch oven, melt 3 tblsp of the butter and add the chopped sage. Cook for a minute or so to release the fragrance, then add the onion and cook over medium heat until it’s translucent and slightly carmelized, about 10 minutes. While the onion is cooking, melt 1 tblsp of butter in a small pan until it foams and then add the rest of the sage leaves and saute until crisp, turning as you cook them. Drain on paper towels and set aside. Add the rice and 1 tsp of salt to the onion mixture and cook, stirring to coat the rice with the butter and onion, about 2 minutes. Turn up the heat to medium-high and add the wine, stirring constantly until the wine is absorbed. Then add just enough stock, about a ladleful, to cover the rice, stir and keep cooking until the stock is absorbed. Continue in this manner, adding a ladleful of stock and stirring until it’s absorbed, then adding more stock, until the rice begins to look and feel done, about 15 minutes. The rice will begin to look creamier and less opaque as it becomes closer to done, but taste to be sure. When rice is done or very close to it, stir in the squash and the stock it was cooked in, the rest of the butter and the grated Parmesan. Continue cooking for 3-5 minutes, check the flavors and consistency, adding more stock if needed. Serve with more grated Parmesan and the fried sage leaves on top. 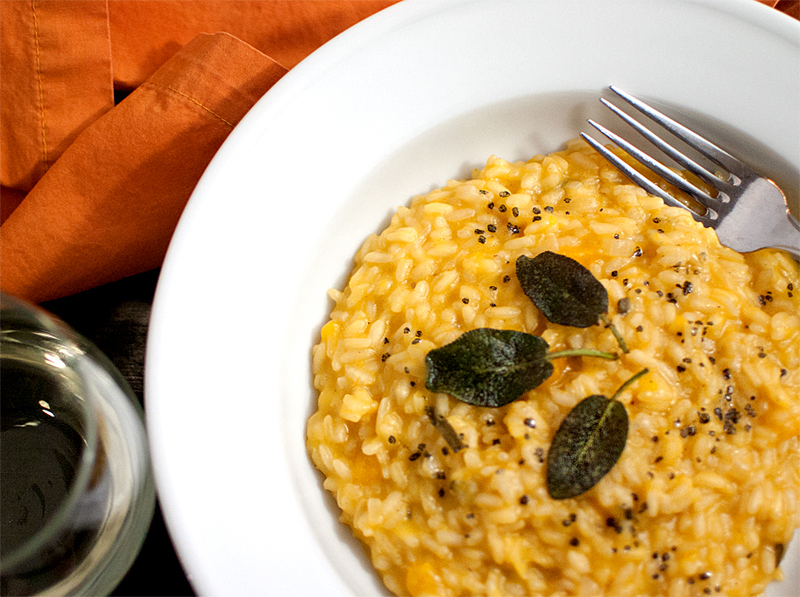 This entry was posted in main dish and tagged butternut squash, risotto.